The first pictures of winners in Monday’s round of voting in The People’s Millions and Jubilee People’s Millions have been released. The successful projects from each of the 15 regions are incredibly varied, and include brass bands, churches, a young people’s community cafe, forest schools, an eco playground and more. 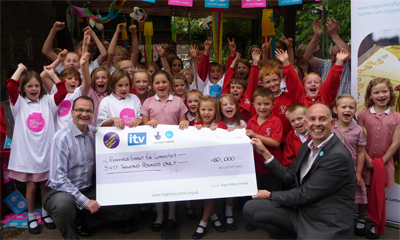 Here is Stuart Dainton from the Village Power CIC project (left) in the central England region receiving a cheque from the Big Lottery Fund’s John Taylor (right), as children from St. Andrew’s Primary School celebrate their win. The money will be used to install solar panels and implement tree planting initiatives throughout the community. Check out the other winning projects as they transform local communities across the UK. Have you decided which projects you’re going to vote for? Visit the website and find out what’s happening in your local area. To help you decide on your favourite projects, don’t forget to watch your ITV regional evening news from 6pm every night this week. ← The People’s Millions – what does it take to succeed?